I'm not going to mince words here...I've been in love (lust?) with Boeing jet airliners since the first time I watched a 707 depart Fresno Air Terminal (FAT) westbound over my house. It was the 707 that sent me into fence-hanging ecstasy after riding my Schwinn Sting Ray to FAT for an afternoon of planespotting. My first airliner ride was in a 707, SFO to SEA, non-stop, and it was a thrill ride for this 10-year-old. These days, I follow Boeing about as much as most pilots. I dream about my first ride in the 787 Dreamliner, and still hope to snag a ride in a 747 someday. Like my readers, I watch from afar as Boeing and Airbus continue their years-long cage match, slugging it out with tanker contracts and wide-body sales contests. We begin each week wondering if this will be the week that the 787 makes its first flight. 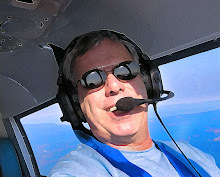 Yes, Boeing is on our minds, and in the case of this pilot, it feels like it's in my soul. After nine hours of fighting holiday traffic from Eugene to the Seattle metro area dodging wrecks in the torrential rain, the last task ahead to get to our beachside cabin was a short ferry ride from Mukilteo across Possession Sound to Clinton. To get to the ferry dock, you have to head west on SR 526, aka the "Boeing Freeway". It's called that because it actually cuts right through the heart of Boeing's gigantic assembly plant. As you pass the plant, the six mammoth doors – decorated by the world's largest digitized graphic image – comes into view on the right. The building is so big, cars parked next to it look like Matchbox cars parked next to a Wal•Mart. To the left are three massive paint hangars, all big enough to house a 747. As I passed the plant, I was blown away that I did not know I would be vacationing just minutes down the road. I showed up early for my 9A tour, and the very first thing I spot as a drive in the gate was one of Boeing's Dreamlifter cargo planes. The sighting alone was super cool, but was nothing compared to what was yet to come. After a short film in the Boeing Theater, we were bussed across the flight line to the 747/767/777/787 assembly building. On the way, I saw several 787s – most in All Nippon Airways livery – in the ground testing area. Just laying eyes on the 787 for the first time was worth the $15 to get on the tour. The bus parked near a sparkling brand new 747-800 fresh out of the paint hangar. So before I got in the building, I had already met two of Boeing's star attractions. We go down inside pedestrian tunnel C and the first thing you see is that this tunnel is so long, it visually goes off into infinity...the other end is a dot if seen at all. We are all amazed at this when the tour guide points out this tunnel runs the WIDTH of the building. After a short cargo elevator ride to the observation deck, we emerge to overlook the first two assembly bays where the mighty 747 is born. In the first bay, as far as the eye can see left and right are huge yellow jigs, some sized to build wings, others in the shape of the -47's nose section. Below us, a skeleton crew (it was Thanksgiving weekend) is milling around a nearly complete nose section, covered in green vinyl to absorb the impact of a carelessly dropped wrench. In various stages of manufacture are also fuselage sections and horizontal and vertical stabilizers. The scene is a sea of tool boxes, scaffolding, ladders, cranes and parts. It seems like organized madness that somehow produces really large airliners. Where Bay #1 was a collection of large welding apparatus spitting out gigantic pieces of -47, Bay #2 is where the 747 actually gets its soul, where it is given life. Nose to tail are five -47s, all 747-800s we are told by the guide. After being built in Bay #1, the parts are craned over to this Bay. Here, the wings are mated to the center section, and a large portable curing "oven" is attached around that section for three days at 140 degrees to seal the main center fuel tank and wing tanks. Next, that rig moves to the next station where fuselage sections are attached fore and aft. The nose – which has now been fitted with avionics – as well as the tail section is attached at the next station. At this point, the landing gear is installed, and the -47 becomes a rolling airframe. Before the planes go out the door, they will be fitted with cargo equipment (or passenger interior), environmental systems and 170 miles of wiring. To look down upon this sea of manufacturing wonderland almost defies description. To the untrained eye, it almost appears cluttered, there is so much STUFF everywhere. But as you will find out in part two of this post, this is one very large, very efficient machine, a incredible system that takes six million parts and puts them together one by one in 16 weeks to produce the world's most storied wide-body aircraft, the incredible Boeing 747. 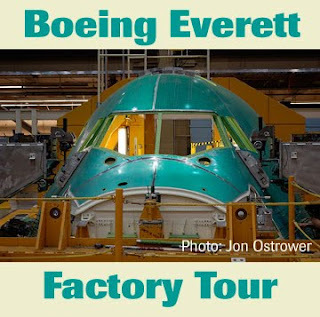 In part two, I will get into the next two stops of the tour, the moving – yes, I said moving – line where the 777 is built, and the new 787 Dreamliner assembly line, which is nothing like anything else in Boeing's Everett plant. If at this point in the post you are not online buying tickets for this factory tour, I promise part two will seal the deal and have you headed direct Everett as soon as possible.